Watch this on-demand webinar from Agricen to learn how SoilLife helps to increase nutrient availability and improve turf performance. 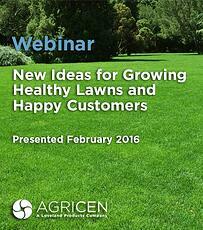 In "New Ideas For Growing Healthy Lawns and Happy Customers," you'll learn more about NutriLife and SoilLife, sustainable fertilizer biocatalysts for turf and ornamental applications. Find out how NutriLife and SoilLife increase nutrient availability and improve plant performance to help you grow healthier lawns.